COSBY – Lewis Everett, 88, of Liverpool passed away in Queens General Hospital, Liverpool on Saturday, October 1st, 2011. Born in Toronto, Ontario, Lew served during World War II as a member of the Royal Canadian Navy. Upon his return to Canada he met and married the love of his life, Tess. 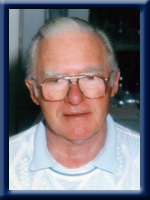 Lew worked as a town planner for the city of London, Ontario before moving his family to the Maritimes. Lewis was a real estate agent throughout most of his life, as well as a respected entrepreneur who owned and operated many business enterprises throughout Nova Scotia. Locally, Lew sowed the seeds for what has now become Cosby’s Garden Centre. He was also employed by Bowater Mersey Paper Company as a draftsman for many years. Lew pursued and excelled in many passions. He was an avid bridge player, gardener and traveler. He enjoyed acting in the Winds of Change as well as restoring old homes and dabbled at inventing. Lew embraced opportunity and thrived on challenges. Lewis is survived by his wife of 68 years, Tess, sons John (Mary) of Chilliwack, B.C., David Franklin of, Liverpool, Chris (Wayne) of Prospect and daughter Sue (Ivan) Higgins of Liverpool. Grandchildren Aaron, Ryan, Meaghan, Dana, Kyle, Hayley, Angus and Adam and three great-grandchildren. It is, however the dignity and respect he showed toward all, the unconditional love of his family, his terrific sense of humour and his infectious laugh that will never be forgotten. To the family,So sorry to hear of Lews passing,I met lew trought Home support,He was a Dear man and i loved to hear him laught which he did often,he is at peace now,may god be with you all at this sad time. Joyce. My heart is with you at this sad time. The time that I spent working for Lew and Tess will always be remembered with fondness. He was a pleasant and kind person who enjoyed a good laugh and good conversation. To Tess and the family , I hope the memories you share will be of comfort to you in the days ahead . To all of Lews Loved ones we give our condolences. He fought long and hard to stay with you and your Mom. God Bless him for that. Your Mom so needs you even more now. Help keep each other strong for her. Your Friend’s are near and we are thinking of you . If there is anything at all we can do ,please we are near. Your Dad was NEAT!!! one of the best . To all of Lew’s family I send my deepest condolences. May he now rest in peace. Please accept our deepest sympathy for your loss. As he crosses the bar; we hope the wonderful memories that you and Lew have made together will help you through this difficult time. Our thoughts and prayers are with you all. To Frank , your Mom & the rest of your family. Please accept our condolences. We didn’t know yor Dad but knew all about what a wonderful person he was. He is in a happier place right now. Our thoughts and prayers are with you all. God bless you. We wish to send our condolences to you all. So sorry to hear of your Dad’s passing. Our thoughts and prayers are with you all at this time of sorrow. What a fight that man of yours gave! And, all in love for all of you. His spirit will brighten the heavens and our memories of him. He was a good man, a kind man, a loyal man and a man who gave his heart. I shall always remember his smile and his joy in life. It was so good to see you and Lew again. I remember your trip(s) through Lawrence on the way to Alabama where you and the Thews wintered for several years. Lew was a delightful person and his spirit was still so evident in August when Candia, Veronika and I visited. I will remember Lew in my intentions and my prayers are with you and your family during this time of loss. . Your Dad introduced me to chocolate zucchini cake from his lunch when I worked in the Engineering Dept. at the mill and of course, I will always be grateful to him for the garden centre! I have fond memories of him. My prayers to you and yours in the days ahead. I wish to send my condolences to you all. So sorry to hear of your Dad’s passing. The Benedict/Norman family extend their sympathy during this time. Lew enjoyed life and people and everyone will have great memories to think back on in times to come. My first game of bridge at the Seaside Bridge Club had Lew & Tess as opponents. After playing the first two rounds, I realized that I was going to enjoy playing bridge at this club. Lew had a way to make one feel very welcomed. We also discovered similar backgrounds and interests. Lew will be missed by many. My prayers to you and yours in the time ahead. We are so sorry to hear of Lews passing. You are all in our thoughts and prayers. Hold tight to all your wonderfull memories of such a great man. If there is anything we can do to help, please do not hesitate! Our hearts are with you all. Dear Tess and family – I’ve lost a great Bridge partner. Lew & I had some great games together; he never got mad when I screwed up, just sort of cocked an eyebrow at me. Go in peace, Lew. I know you’ll be dearly missed. We are so sorry that we have lost our wonderful Lew. Loved him since I was a little girl. Will always miss him. Dear Tess its been many years since I have seen you but I remember spending some special times with Lew and you – my heartfelt sympathy. Take care and best wishes to all of your family. Sue and family – So sorry to hear of your Dad’s passing. Our thoughts are with you at this difficult time. So sorry to hear of Lew’s death. He may be gone from this earth but he will live on in the goodness he has instilled in his family and those fortunate enough to call him friend. So sorry to hear about your loss, my thoughts are with you at this difficult time. Frank & Family: So sorry to hear of your loss. We did not know him personally but know that he will be missed.